This week, Cathy Hill, Education and Training Lead at The Nightingale Centre & Genesis Prevention Centre offers an informative blog focusing on radiation and mammography. How is a mammogram produced? It is a digital image produced when low dose radiation (but high energy) is converted in to an electrical signal which in turn produces an image. Not too unlike how your pocket camera produces holiday snaps, but without the radiation! What is radiation? According to the NHS choices web site, radiation refers to any sort of energy that can travel through space as a wave or particle. Radiation is everywhere, in the ground; rocks and stones, and even in some foods, such as bananas. This is called background radiation and is unlikely to cause health problems as it is in such low levels. Ionising, which is classed as high energy radiation. Whilst non–ionising radiation is unlikely to be harmful, there are still certain types that when exposed to too much, can be harmful, such as ultraviolet radiation; an increased exposure to ultraviolet radiation can cause sunburn and increase your risk of developing melanoma and non-melanoma skin cancer. Some people also think that the radiation given off by telecommunication devices could also be harmful, but as yet a number of studies have not identified any health risks associated with these devices. 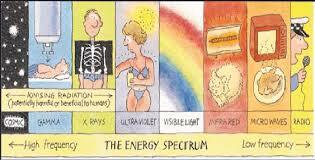 Which brings us on to ionising radiation; this is commonly used in medical examinations. It is stronger than non-ionising radiation and can therefore cause damage to the cells in your body, which in turn can lead to an increased risk of cancer in later life. The more you are exposed the greater the risk – but these risks are small in comparison to the natural rate of cancer development which is 1 in 3. In the UK this number is 2.7mSv. 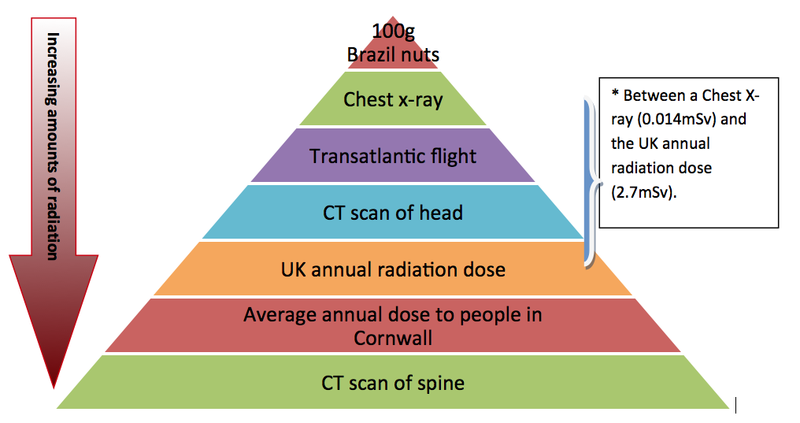 We can start by basic comparisons, for example, 100g of Brazil nuts contains 0.01mSv, which is more radiation than you would receive from a dental x-ray (0.005mSv). But this is not as much as you would receive from a chest x-ray (0.014mSv). However, a transatlantic flight (0.08mSv) would expose you to more radiation than a chest x-ray (0.014mSv), because you are closer to the cosmic radiation emitted from the sun. Where does a mammogram fit in this scale of risk? * Somewhere between a chest x-ray and the annual UK radiation dose (2.7mSv). Q. So, should I go ahead and have a mammogram? Is the risk from radiation still a concern? The benefit from screening mammography and early diagnosis far outweigh the risk. But I’ve heard all that before, what does it actually mean? A.1. A mammogram can save your life! If cancer is found early, you reduce your risk of dying from the disease by 25-30%. Lifestyle factors like being overweight and not exercising are far more likely to cause breast cancer than having a mammogram. Women aged 40-74 who have regular screening have a lower chance of dying from breast cancer than those that don’t (www.cancer.gov/types/breast/patient/breast-screening-pdq ). Ultimately: Your risk of radiation induced fatal cancer is MUCH LOWER than your lifetime risk of cancer. Does this help answer some questions relating to radiation dose and having your mammogram? This entry was posted in Breast cancer, Mammogram, X-rays & Radiation and tagged mammogram, x-rays. Bookmark the permalink.